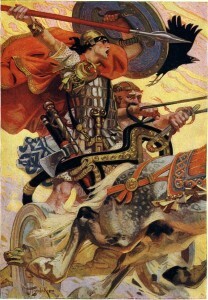 Cuchulainn is perhaps one of Ireland’s most famous mythical heroes and with good reason. It’s the story of a young boy who wants to be a warrior just like his father. He proves himself to be the greatest of the Read Branch warriors, even though it is prophesied that he will have a short but glorious life. He finds love with Emer, friendship and heartbreak with Ferdia, and ultimately everlasting glory on the battlefield. The legend also offers a glimpse into ancient Ireland, with it’s kingdoms, bards, poets and magical druids. “The Dog of War: The Legend of Cuchulainn” is a selection of the best-loved tales from the life of Cuchulainn. I respect your privacy and will never share your email with any other parties. By signing up, you will receive some update emails and new release notifications. You can unsubscribe at any time. © John Dwyer Books 2019. All rights reserved.